Hesitant fuzzy linguistic term set is an efficient tool to represent human thinking in decision making process. Borda rule is a powerful approach to aggregate opinions of a group members and it has been extended to several versions. In this paper, we investigate the Borda rule in the hesitant fuzzy linguistic context from both broad and narrow perspectives which are based on the possibility degree and the score function of the hesitant fuzzy linguistic term set. Moreover, we take into account the confidence level of linguistic evaluations with a parameter being generated from the evaluations. 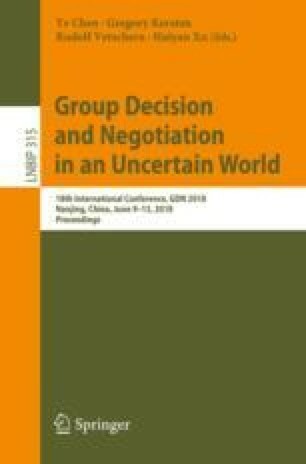 Finally, a numerical example is given to illustrate the efficiency of the Borda rule in group decision making within hesitant fuzzy linguistic information. The work was supported by the National Natural Science Foundation of China (71501135, 71771156), the 2016 Key Project of the Key Research Institute of Humanities and Social Sciences in Sichuan Province (CJZ16-01, CJCB2016-02, Xq16B04), and the Scientific Research Foundation for Excellent Young Scholars at Sichuan University (No. 2016SCU04A23).